A business needs to be found in order to get customers, right? That may seem like a silly question, but let me ask you another one. What have you done lately to check on your online visibility? More businesses than I want to think about will likely answer with, nothing or even, “I don’t know how to do that”. If you aren’t monitoring your online visibility you will not know if there is bad data related to your business on the Internet. Potential customers are looking for your products or services online – will they find you? The good news is that Local Site Submit (an Advice Interactive Group company) has created a set of free tools to simplify the process of monitoring and maintaining your online visibility. The digital landscape is becoming more and more complex every day with algorithm and protocol changes from Google and others, as well as the ever-changing habits of consumers. It can be overwhelming to keep up with it all and manage the day-to-day operations of your business. Let me tell you about our free Local SEO Tools we created for business owners just like you. My goal is to help your business succeed and our entire team is passionate about doing just that! 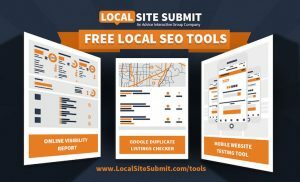 So take advantage of our free Local SEO Tools offered through Local Site Submit and make sure your business is visible online to all future customers.